[Jan Keil, State-of-the-art electricity storage systems researcher, Deutsche Bank:] "Phasing out nuclear power has several implications for the integration of renewables. One effect is that a power generation gap emerges which makes faster growth of renewable energy possible and even necessary…A challenge is that there will be a shortage risk by 2025. The gap to which supply cannot meet demand can amounts to a total of 10 TWh…due to the loss of nuclear power and…because other conventional power plants will reach the end of their life span." 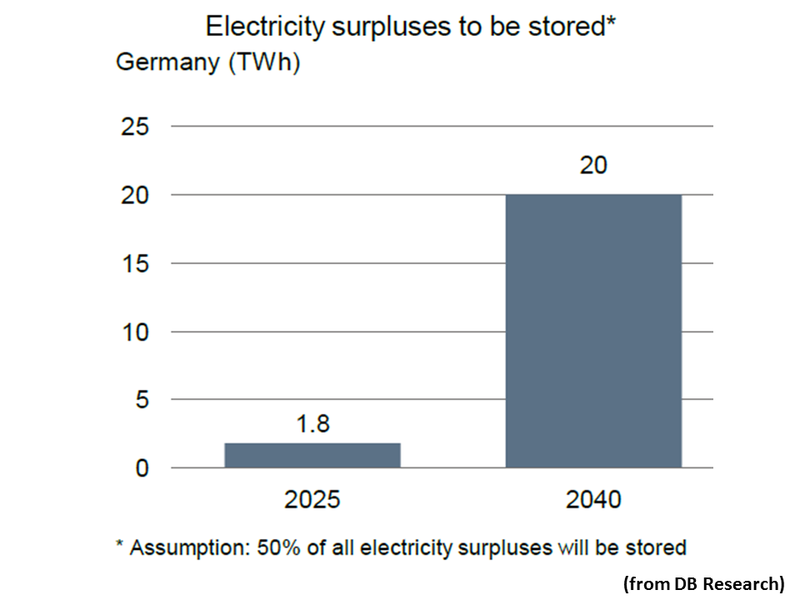 [Jan Keil, State-of-the-art electricity storage systems researcher, Deutsche Bank:]"…[It can be eased by] other already existing power plants (hard coal, natural gas or biomass), an addition of new flexible natural gas plants, accelerated growth of renewables or energy imports. Energy storage can also help…[The] need to produce energy when there is no wind and sun implies demand for at least 4.5 GW of energy storage capacity or flexible new power plants by 2025 (12.5 GW by 2040)…[Some must be] conventional gas power plant capacity…[A] pan-European grid will ease many problems associated with the integration of renewable energy. A geographically larger grid, where power can be transported from Germany to Norway or to Italy and back, will raise the share of wind energy…[A] higher percentage of capacity installed can be taken as base load power [and excesses put less strain on the grid] when the area becomes larger…Both of these effects allow a higher share of wind and PV power…[V] ehicle-to-grid will [not] be a viable option for the integration of renewables. Battery storage is already expensive…In EVs it will never be competitive compared to pumped hydropower or compressed air energy storage." [Jan Keil, State-of-the-art electricity storage systems researcher, Deutsche Bank:] "…Pumped storage hydroelectricity is by far the cheapest and it is also the only technologically mature storage method today. Storage costs amount in some cases to just 2 cents/kWh…There will have to be compressed air energy storage at some point…but a cost and efficiency gap will remain in the near future…Electrochemical storage has great potential for the future due to its high energy density, its flexibility…and the different options to transport and store it…The main problems today are that the overall efficiency of the full cycle of electricity-to-H2 and H2-to-electricity conversions is relatively low and that the associated costs are very high…"
[Jan Keil, State-of-the-art electricity storage systems researcher, Deutsche Bank:] "…Economically efficient energy storage will have positive effects on PV and wind…Renewable energy can reach a share of 40% of all electric power generated in Germany…[but] you need storage facilities to provide backup capacity for short-term fluctuations. Also, when wind and PV reach a market share of 70%, which is our scenario for 2040, it makes sense to store 7% of all wind and PV output…[O]n the one hand storage will be essential for keeping the costs down, because if, say, 15% of all wind energy will be lost, this would imply fewer kWh of sold output per year for each wind turbine and solar installation, and thus higher costs per kWh…On the other hand, storing is costly and will raise the costs of the renewable energy that will be stored…The impact on the average costs of production of renewables will be relatively modest in our scenarios…"